Most dogs are not exercised enough, and it's often difficult for humans to get them to an area, like a dog park or beach, where they can really run around leash free. A very old means of transportation, made into a sport by the British and Europeans, is dog carting, whereby dogs power a human-steered carriage, a much smaller one than a horse carriage, on dry land. Dog carting has recently become popular in the U.S., but even more so, is the sport of dog scootering, where, instead of a cart, your dog(s) pulls a scooter that you are riding. I'm sure the scooter is easier, especially for one dog to pull, and it's probably more fun for you -- but maybe not as practical when you are going to the market. 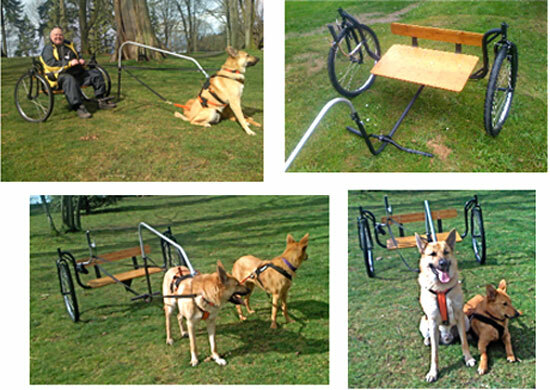 Fortunately, there's a super website you can use as a resource if you are curious about the sports of dog carting and/or dog scootering. It's called DogScooter.com and it provides a lot of information, how-to videos, and it sells everything you need to get started in these hot sports for you and your dog. Here's a short YouTube video so that you can see dog scootering in action. 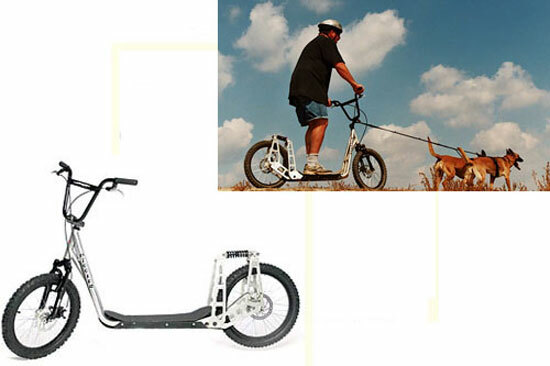 This was taped by funfilming and it is called Dog Scootering DDA. Thank you, funfilming, for making this available. UPDATE: DogScooter.com is no longer active. 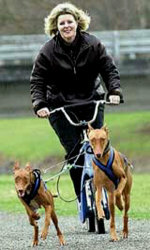 A recent updated article on Dog Scootering that you may find interesting is Urban Mushing. You won't be able to do these sport on main roads, of course; you need to exercise a lot of caution. But, for short trips on back roads, these sports would be a great opportunity to save gas, exercise your dogs, and spend some fun time with him. And even small to medium dogs enjoy running; it's amazing how much energy little to medium dogs have well into dog middle age. Just put a leash on an untrained small dog and you'll know what I mean. My silky terrier used to pull me up a 60 degree incline every day! I highly recommend the 10 minute educational video by Lisa Lipscomb called Dog Scootering 101 downloadable on You-Tube here. it to heavy for one to two dogs to pull a person and that cart or scooter. Wouldn't that ruin the muscles eventually? Even though it might built the muscles up at first. A) A dog should never be asked to pull more than 3 times his weight while scootering. Weight pull dogs can pull ten times their own weight, but this is for a very short distance. B) On flat land, once started, the force on the tug line is only 1/10th the weight of the scooter and rider. Smaller dogs will require assistance on startups and inclines, and even larger dogs will require rider assistance on steep inclines. C) Like any athlete, conditioning should be ramped up slowly. You can't take a dog that has never scootered and run him for 14 miles pulling a passenger the whole way. On the first run you maybe go a mile, and help out a lot. D) Scootering is no more stressful on the dog than a workout or sports is for you. Don't overdo it, stop before the dog is tired, and keep up a steady schedule of workouts to stay fit. High energy and working breed dogs will really enjoy the work and become regular addicts of the sport. My own puppy is too young to be allowed to go far with the scooter, but she eagerly thrusts her head through the harness and dances in excitement when I'm trying to put her booties on. E) Being a couch potato is no better for dogs than for people. Get out and be active with your dog! Just because it's possible . . .